The medulla appears intermittantly in this section of the whisker. The pigment is concentrated in the cortex as is evident by the more intense color near the edges where the pathlength through the pigmented area is greatest. 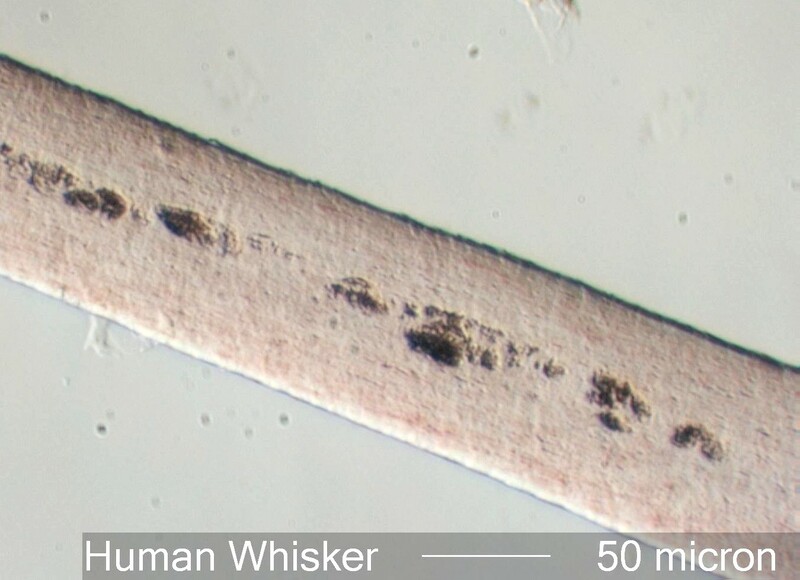 Human whiskers tend to be ribbon to elliptical in cross-section. The scale count may be from 8 to 15 per hundred micrometers. The major axis of the cross-section may be in excess of 120 micrometers. The medulla may be 3/4 of the width but generally is around 1/3 or less. The medulla may not be easily discernible or appear intermittent but will be evident under polarized light. Pigment bodies and areole vesicles may be present.